NEW YORK (AP) -- Two new Android phones will look and sound familiar to those who have been paying attention to phones. That's because these two devices are replicas of Samsung's Galaxy S4 and HTC's One, except they lack most of the bells and whistles added to the original models. The modifications Samsung and HTC apply to Google's Android software are meant to be improvements. But I've complained before about how the changes actually make phones more complex to use. The S4 even has an easy mode for first-time smartphone users, an admission that the normal mode is too confounding. Google worked with both Samsung Electronics Co. and HTC Corp. to come out with "Google Play" editions of the hit phones. Instead of customized software from Samsung and HTC, the Google phones run a pure version of Android, just as it was developed by Google. Google lets any phone maker use its Android operating system for free. To set themselves apart from competitors, phone makers often add their own touches to devices. They rearrange the menu or load additional apps. Wireless carriers also like to add their own apps. Before you know it, phones are bloated with features and apps you don't want and can't get rid of. Consider my experience with the original S4 over the weekend. As I tried to adjust the camera's flash setting, I inadvertently made some postage stamp icon pop up. That activated the camera's dual-shot mode, which snaps a shot of you with the front camera to superimpose over whatever you're shooting with the camera on the back of the phone. I didn't want that, but I couldn't figure out how to get rid of it. My friend couldn't either. So we bagged the shot. Taking photos with a phone is supposed to be fun, not a chore. With Google's version of the S4, I get a no-frills camera that is easy to figure out. It lacks gimmicks such as dual shots and the ability to combine several images of motion into a single shot. It offers about a half-dozen shooting modes, such as night, action and panorama, rather than the dozen or so on the original S4. But a half-dozen is about a half-dozen more than I need and use. Google's S4 also lacks the original model's ability to pause video automatically when you look away from the screen or to scroll down an article when you tilt your head. Those features may sound cool, but they often don't work properly. The Google version of the S4 also has alarm sounds that I can actually wake up to. Samsung had substituted those sounds with soft, soothing melodies that I end up incorporating into dreams. I've overslept a few times as a result. As for Google's version of the HTC One, you don't get a busy home screen filled with news articles and Facebook status updates your phone thinks you want to read. Instead, you get a clean page with few apps. It's up to you to add the ones you want to see and use. Both Google phones feel spare and minimal, which is great because it makes me feel in control. If I want to constantly know the weather, it's easy to add a weather widget to the home screen of either phone. But it's not forced. The same goes for apps. I get basic functions such as text messaging and the clock and a range of Google services such as Gmail and YouTube. If I want other apps, I can easily tap the Google Play icon to get them. With the original S4, Samsung tries to steer you into its own app store, as well as its own music and video players. You end up with too many ways to do the same things. You might think it takes a lot of work to add the apps you want to Google's phones, but it actually takes more work to hide or turn off everything you don't need — that is, if you can at all— with Samsung's and HTC's versions. Now for the bad news: The Google edition of the S4 sells for $649, while Google's HTC One goes for $599. You can typically get the original models for $100 to $200 through your wireless carrier with a two-year agreement. And unless you're on T-Mobile, your monthly bill won't go down just because you pay full price for the phone elsewhere. In addition, both Google phones are compatible only with T-Mobile, AT&T and other carriers that use GSM cellular technology, not the CDMA networks used by Sprint and Verizon Wireless. The Google edition would have been great for Verizon customers who still have unlimited data plans. Verizon no longer lets you stay on that plan if you buy a subsidized phone, so you'd have to pay the full price anyway. The Google phones are also ideal for people who want the latest Android system that Google has to offer. You'll be able to update your phone as Google releases new versions of Android. Normally, phone makers and wireless carriers delay updates by weeks or months, so you can only read about those new Android features. There are a few useful Samsung and HTC add-ons that Google does bring to its versions of the phones. Google's S4 is compatible with Samsung's S-View flip cover. Using a magnetic sensor, the phone detects when the cover is closed and switches to a special mode that gives you the current time and details about who's calling through a small window in the cover. You can answer or reject a call without flipping over the cover. Google's HTC One, meanwhile, shares the original model's front-facing speakers, giving you great sound when you're watching a movie or listening to music. Both models also have cameras with larger sensor pixels for better low-light shots. Our tests show that the HTC One produces low-light images with less distortion than other Android phones, though images aren't particularly crisp because the resolution is lower. There are a few things I wish Google would have brought to its phones and to Android in general. In the original S4, the on-screen keyboard has a row of numerals to type in. With the Google S4, you have to hit a button to get another screen with numerals, then toggle back for the letters. The original S4 also has the ability to run two apps side by side in a split window. That's gone in Google's S4. Meanwhile, the original HTC One has the ability to make calls, send texts and take photos by sliding icons from the lock screen. With the Google version, you have to unlock the screen before getting icons to those functions. On both phones, Google also adds one feature I could do without: a 360-degree panorama known as Photo Sphere. Neat as it is, it detracts from what is otherwise a just-the-basics camera. It would have been better as a separate app for those who want it. But that's no reason to shun the Google phones. The minimized feel of Google's versions underscores how busy software can detract from good hardware. Take away that clutter, and you have excellent phones. It's a bummer that you can't get the simplified phones through regular channels. You can get them only through Google's online Play store — for hundreds of dollars more. The new phones are existing Samsung and HTC phones loaded with Google's version of the Android operating system. That's the version that Google makes, before phone makers and phone carriers load Android up with their own features and apps. These phones are good options for those who don't like all the bells and whistles in the original models. They are cleaner and easier to use. But they are also more expensive, as you have to pay full price through Google's online Play store rather than a subsidized price that wireless carriers offer with two-year agreements. These phones aren't compatible with Verizon's or Sprint's CDMA networks. If you're on AT&T, you'll be paying more for the phone without any reduction in monthly phone bills. If you're on T-Mobile, though, expect to save $20 a month, or $480 over two years. You're still paying about $70 more overall for Google's S4 and $20 more for Google's One, but it's not the hundreds of dollars you'd be paying on AT&T. 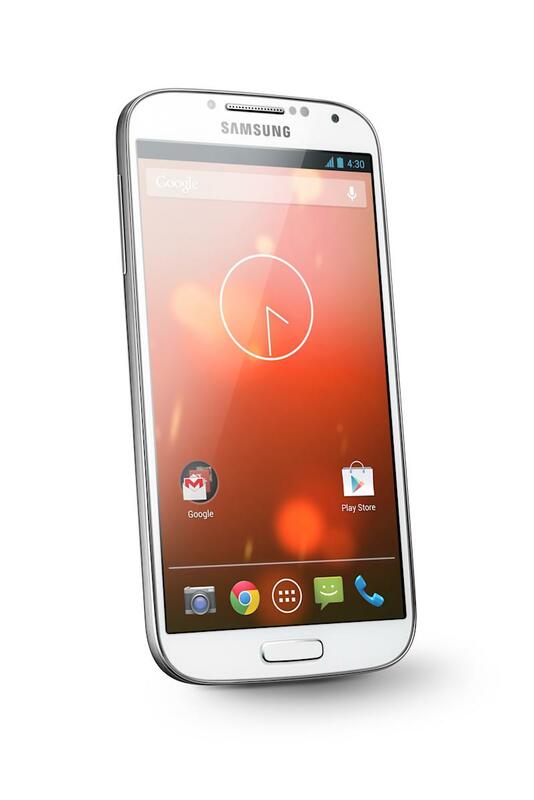 The one-time, upfront cost is $649 for Google's S4 with 16 gigabytes of storage and $599 for the One with 32 gigabytes. Both phones are available in the U.S. only through Google's online Play store, with shipments expected by July 9.